In a conversation with Neimeh and Yaseen Shamlawi in their home in Hares we hear about the traumatic journey they have gone through but also the painstaking efforts they have made to build a campaign for their son’s freedom ever since he was arrested in the middle of the night on the 17th of March 2013. On the 14th of March a settler from the illegal settlement of Yakir crashed her car with her three daughters inside on the main road near the village, leaving all of them with various injuries. Despite the horrible event seeming like an unfortunate accident, over the following days 13 boys from the village of Hares were arrested. Eventually five of them were charged with attempted murder stemming from allegations that stones were thrown onto the road by boys from the village. Ali’s mother recalls to us the night he was taken by Israeli soldiers, 25 of them entering the family house after the door had been forcibly opened. They went from room to room waking everyone up before grabbing Ali and instructing his parents to find his shoes. Before they left both Niemeh and Yaseen recount how one of the soldiers told Ali to go and “kiss his parents goodbye”, to which his mother remembers saying that she didn’t need to as she would see him in a few days. Over a year later and Ali and the other four boys, Tamer Souf, Ammer Souf, Mohammed Suleiman, and Mohammed Kleib are still imprisoned. We asked Neimeh and Yaseen why they thought that the Israeli military had been so harsh in their pursuit of prison sentences for the boys, both parents shrugged with what is obviously still raw bewilderment as to how their son, 16 at the time of his kidnapping, is now facing up to 25 years in prison. “No-one saw anyone throwing stones,” Niemeh says again and again during our visit, and indeed the lack of evidence is startling. Originally no one made any claim that stones were thrown. The first search of the car, by police from the illegal settlement, produced no evidence of any stones but a subsequent search two days later uncovered a single stone in the vehicle. 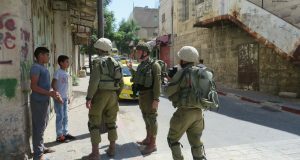 The court, like the vast majority of cases against Palestinians, through the Israeli military system has not called a single Palestinian witness. Instead they have focused on an Israeli woman who was driving nearby, and a passing truck driver, neither of who can say that they saw anyone throwing stones. The conversation turns to Ali and how he’s coping with being in Megiddo prison. “He is crying all the time when we see him as he misses his friends, family, and school,” Niemeh tells us. While the five Hares Boys do get to see each other fairly regularly whilst they have been incarcerated this is of little solace due to the fact that they find themselves in an adult prison and are unable to make or receive any phone calls. Their parents are only granted a visit twice a month. It is also solely them who can make the long journey to the prison due to Israel’s procedure of granting permits. This has meant that Ali has not had the chance to have any sort of meaningful conversations with his brothers, sisters or any other family and friends since his sudden arrest. Inside the prison itself, very little is provided by the Israeli state so every time they visit, the parents try and bring what their sons require, whether it’s bed linen, books to read or clothes. In terms of education Ali and the other boys only receive two hours of classes a week, which is currently classes in Arabic and Mathematics. There is no chance of formal qualifications resulting from this small amount of study, at a time when the boys should have been working hard in school in order to begin to decide where they want their lives to go. Like so many other things this is something else that the Israeli authorities have taken away from them. to 45 minutes with him, and the entire encounter takes place through glass and over a phone. “I can’t touch him,” Niemeh says shaking her head sadly. The trips to Salem military court are perhaps more difficult than the prison visits for the parents, as well as other family and friends who do have permission to attend the court. This involves arriving at the court at 9am before waiting with dozens of other relatives of accused Palestinians, before finally two people are allowed to attend the hearing itself. Ali’s mother talks of desperately trying to talk to her son face to face but Israeli security officers preventing her from getting even three meters from him, only allowing her one minute and sometimes even blocking her view. 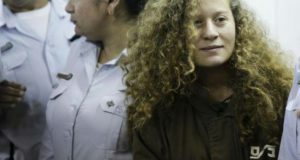 The trend, as in so many hearings for Palestinians accused of crimes by the Israeli military, is continuous postponement, hence why Ali and the other Hares boys have been awaiting trial for over a year. The latest postponement means the next hearing will be on the 10th of April. However, despite this, the way in which Ali and all the other Hares Boys’ families have organised themselves and fought for justice is remarkable. 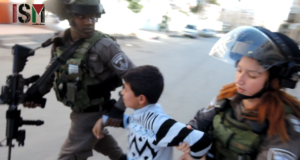 With the support of organisations including the International Women’s Peace Service (IWPS) and the Defence for Children International (DCI) a campaign has been built and continues to put pressure on the Israeli judiciary system. The families meet regularly, supporting one another and the Palestinian Authority has helped them with lawyers. Although the fact that the boys remain in prison and continue to face such draconian charges demonstrates that so much more needs to be done. When we asked the family what people could do in their home countries the answer was very clear. Niemeh was adamant that putting pressure on the ambassadors of countries to attend the hearing was a crucial step with an emphasis on sharing the story and making people understand the realities of Ali and the other boys’ situation. Therefore following the case, discussing it with people who are unaware and generally increasing the knowledge of people is crucial. Unsurprisingly all the Hares Boys need financial aid as well. Currently Ali’s parents alone require another $2000 for legal costs (you can donate here). As activists who support the Palestinian struggle against the occupation we believe it is our duty to back the campaign to free the five Hares Boys. In fact anyone believing in universal human rights and justice should be fully behind the boys and their return to their families.